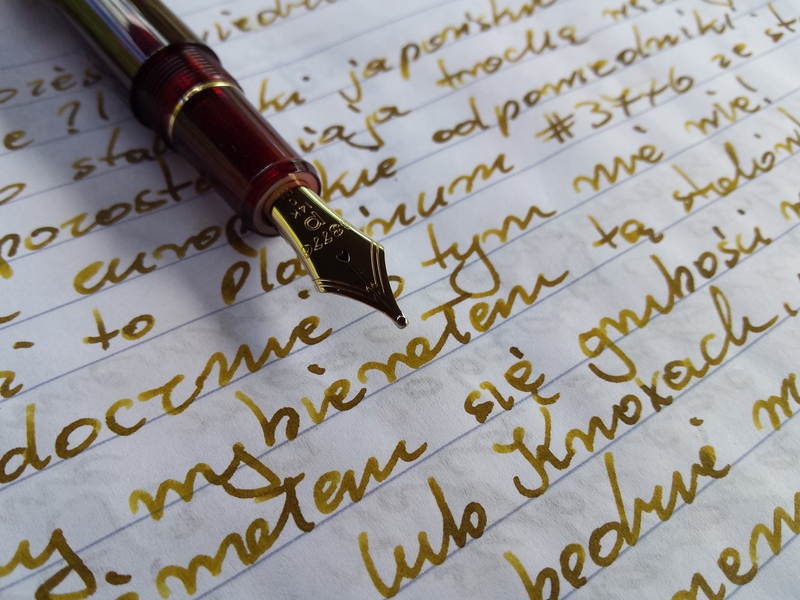 Sometime ago I lost few of my daily pens, as one of replacements I bought this Platinum #3776 with a C nib, this is really broad nib I think I can tell that this is the broadest nib I have seen – for comparision Kaweco B nib or Knox OBB looks pretty anemic in comparison to this nib. This entry was posted in Overall on 3 August 2015 by Konrad Żurawski. Cherry ink is one of standard inks, this means it is only based on dyes easily soluble in waters. And therefore this ink is not resistant to water. Color of this ink is well balanced red with hints of pink. This entry was posted in Standard Ink on 3 July 2015 by Konrad Żurawski. GreenGold is one of the standard inks, which means that it is based only on dyes that are easily soluble in water. The result is that the ink does not have virtually no water resistance. This entry was posted in Overall on 3 July 2015 by Konrad Żurawski. This entry was posted in IG-Standard, Iron Gall Inks on 17 January 2015 by Konrad Żurawski. This entry was posted in Iron Gall Inks on 17 January 2015 by Konrad Żurawski. This entry was posted in Overall on 31 October 2014 by Konrad Żurawski.